p>BEST AGILITY TRAINING EQUIPMENT IDEAL FOR KIDS, ATHLETES AND COACHES - ALL INCLUSIVE WITH LADDER DRILLS eBOOK AND BAG! ENDURANCE PRO WITH 11 RUNGS IS THE SECRET FOR GREATER INDIVIDUAL AND TEAM RESULTS! GET AHEAD OF ANY COMPETITION! Ideal for staying firm on your legs, acceleration, lateral speed and directional agility, enhancing balance, Rhythm, timing and footwork. Gain the ability to change direction quickly. 15 FOOT SPEED LADDER IDEAL FOR HEAVY USE DAY AFTER DAY! Includes All You Need To Get Going Indoors Or Out. If you've never tried one for yourself or your family or your team, don't hesitate because it's a very healthy form of fun exercise that makes a difference! Make an Intelligent decision, become a big fan and get started while the promotional price lasts! 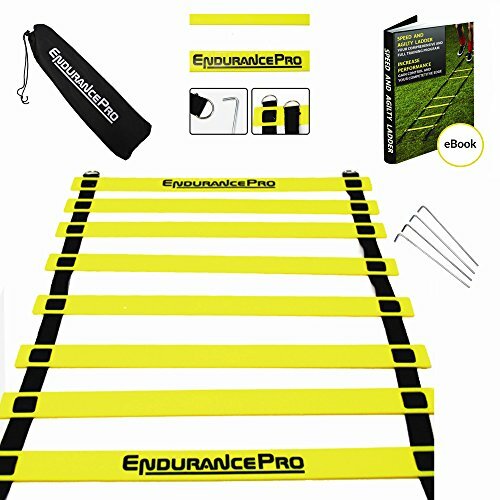 ADD ENDURANCE PRO AGILITY LADDER TO YOUR SPEED TRAINING EQUIPMENT TODAY AND MAKE A DIFFERENCE. BEST QUALITY AGILITY LADDER - Unlike others our agility ladder doesn't contain cheap materials or flimsy rungs. It is durable and is easily secured.15 foot 11 rung all sports agility training equipment IDEAL GIFT for your friends, wife, husband, dad, mom, sisters, brothers and more. PUT A SMILE ON YOUR FACE - Promote higher performance because everyone loves to perform their best. Lift their self-esteem and your pride while at the same time making it fun. Your smile and their smile is worth it! If you have any questions about this product by Endurance Pro, contact us by completing and submitting the form below. If you are looking for a specif part number, please include it with your message. Premium Agility Speed Ladder - 13’ Long with 12 Adjustable Rungs, Ideal for Soccer/Football, Basketball, Hockey, Speed Training, Kids, Coaches and All Sports. Convenient Carry/Storage Bag Included.